This power kit includes one 5 foot Cat 5 Ethernet cable and our USB Micro B Universal Power Adapter. This kit enables you to power your Promira™ Serial Platform directly from any wall outlet, while communicating with your analysis PC over Ethernet. 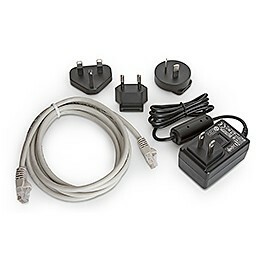 The universal design of the power adapter provides connectivty to outlet types A (mainly used in the USA, Canada, Mexico & Japan), C (mainly used in India), G (mainly used in the United Kingdom, Ireland, Malta, Malaysia & Singapore) and I (mainly used in Australia, New Zealand, China & Argentina). For a full list of plug and socket standards click here. Using Cat 5 Ethernet for data communcations provides high speed data transmission, enables networked utilization of your Promira platform, and makes factory floor setup and automation easy. For most applications, the standard 0.5 mA supplied by a standard USB 2.0 connection is sufficient to power your Promira Serial Platform. For certain higher speed applications, such as SPI Active - Level 2 Application, SPI Active - Level 3 Application, Quad I/O SPI functionality, and providing external power to your project, the Promira platform may require additional power. This kit provides a 1.2 amp power adapter plus a 5-foot Ethernet cable for your development, debugging and production needs. This kit is required to power the Promira Serial Platform if you are using Ethernet for your data transmission. Why Suffer the Cost-Effective Dilemma of Either Lower Cost or Higher Performance? The Total Phase Promira Serial Platform Gives You Both.